When David Plotz left Slate for a new venture, there was it's fair to say, a little head-scratching. This venture was Atlas Obscura - a guide to the strange, surprising and wonderful places of the world, with the content generated by the locals themselves. We all know these spots - these places we like to show people who visit us, basking in the vicarious delight of finding an interesting place that's just a little off the beaten track. We probably all secretly covet them too, wanting them to not become too well known or widely heard about. Admit it. We've all thought that about a special place. But amongst genuine enthusiasts there is another urge at work - the wish to share knowledge, especially those most obscure or geeky bits of it. That's where Atlas Obscura comes in. From strange monuments to hidden subways, and from secret gardens to lost nuclear bunkers - the world of Atlas Obscura is slightly nerdy but utterly loveable one. One in which you can easily lose many, many hours. Today was International Obscura Day, and all over the world hundreds of the places documented on the website were opening up in a global celebration of all things hidden and curious. 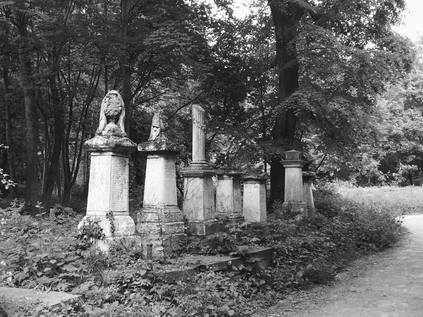 We'd spotted that among them was Tower Hamlets Cemetery Park - formerly one of London's 'magnificent seven' Victorian cemeteries, opened to accept the city's dead who were, in the most literal sense, spilling over from the ancient churchyards. We set out early, taking a relaxing trip to London for the second week in a stretch, and making our way eastwards. Our first call was at Stratford for a little shopping - I think I did pretty well to survive for a couple of hours in Westfield before getting frustrated and irritable with the public. It also became apparent during this part of the day, that recent events had taken their toll on my patience - I felt stretched and downcast as I surveyed the Olympic Park from the restaurant where we ate. But, our planned visit soon piqued my curiosity, and we headed to Mile End. There was time for a brief walk to look at the Regents Canal before we assembled at the Cemetery Park, and near the bridge we discovered a surprisingly well cared for rose garden nestling between the canal and a small modern housing development. The sun was beating down on the city - dry, dusty and busy passing not far from us. But this little oasis of a garden was quiet and pleasant. It was our very own bit of Obscura for a few minutes. We approached the park via Hamlets Way, a busy confusion of stores and houses with numerous layers of the ever changing East End population tumbling over each other. Once inside the gates, next to the crumbling brick lodge and the more recent Soanes Centre, the peace and tranquillity was evident. We paused on a bench, watching people assemble and looking at some of the nearby grave markers. Despite housing encroaching on the park, it was shielded by tall, old trees which swayed in the breeze. A private and rather wonderful spot. There was no doubt this belonged in the Atlas at all. Soon, our guide Ken arrived and took us into the building where he and two other employees are based. Some quick admin later, and we snaked out into the park once again while Ken explained how the cemetery had come into being, and how after its closure it became threatened by re-development. Development so aggressive in fact, that only a few short years after the final burial, the borough had cleared a swathe of the stones by bulldozer. But the story of the park is a story of a community knowing it has something special on its hands - they organised, protested and persisted - and the site was eventually retained as a park with the Friends of Tower Hamlets Cemetery Park providing management and custodianship. It stands as an early and enduring example of localism which is inspiring, especially when the scale of the undertaking is considered. Because, this is a huge park! The cemetery, given its location in the East of the city, had to do two things which perhaps set it apart from the rest of the magnificent seven. Firstly, it had to accommodate people from a variety of faiths, sects and beliefs - and therefore unlike others it isn't segregated into sections, but devotes the whole space to the community it serves. It also had to accommodate far more poor folk in 'paupers graves' than other cemeteries. Now, the site is mostly given over to woodland, with venerable trees snaking between mossy, intriguing headstones. The monuments here are a little less ostentatious than Highgate or Kensal Green - columns and urns dominate, among stones of dark purple granite and occasionally welsh slate - but the sheer volume of graves is remarkable. There are, it's said, more people buried here than alive now in Tower Hamlets. Well over a quarter of a million souls found their last rest here before it became a park. As we walk and listen, Ken proudly points out the flora and fauna they have introduced in the managed areas. He is particularly taken with telling us which plants are edible, breaking off leaves and stems and encouraging us to taste and describe. Two young children in the group are far braver than most of the adults, and Ken finds a ready audience - particularly in the young girl who is a budding environmentalist and clearly holds him in high esteem, skipping along behind him beneath the tunnel of brooding old trees. Occasionally the sun bursts between branches and picks out a stone. It's a very special afternoon indeed. There is also plenty of evidence that the park is still a valued community asset. As we clog the pathways with our straggling group, Ken occasionally reins us in to let a park user pass by. He knows them all it seems, many by name, and has a surprising recall for their lives and routines. Not distracted by this though, he demonstrates how to cure a nettle sting and in the process bursts a lifelong balloon of certainty - dock leaves don't work. Nettles have their own antidote stored in the sticky sap of their stems. He also demonstrates how to eat a nettle successfully - I don't join in, I have an entire boyhood of stored memories of the aching stings they produce and I'm just too clumsy and uncertain to 'grasp the nettle' how Ken does. At the centre of the park is a wide grassy space where the non-denominational chapel once stood, before the Luftwaffe claimed it during the blitz. A fenced off area beside this marks the part of the park which the borough intended to leave as a cemetery when they brought in the bulldozer. It's a tiny, crowded park of the site against the south-western corner of the site. It's amazing to think how this could all have been so different. As we navigated the park, coming up against the low brick viaduct carrying the London, Tilbury and Southend Railway out of the city, notable burials were mentioned - not least "White Hat Willis", the owner of the Cutty Sark and Will Crooks, a much-loved local poverty activist and Mayor of Poplar. But more affecting perhaps were the mass of public graves, organised as long trenches and most often unmarked save the odd, tiny stone. A contrast indeed to the line of tall, pointed and distinctive Charterhouse graves, the resting place of Monks from the city who's own burial site had also filled to overflowing. There is one surprisingly new monument too - that for John Buckley VC, hero of the Indian Mutiny, long lost in a mass burial site here but found after diligent work by volunteers. The stone is discreet and secluded, being left to nature in a mark of respect to the local population who probably take a rather different view of Buckley's 'heroism' in strapping mutineers to cannons before firing them. All too soon, we realise that the planned tour has over-run by over forty minutes, and we make a swift loop back around the circular track used for turning horse-drawn hearses and head for the gates. It feels like there is much more to see here, and a great deal more to know about the place. Ken urges us to stay in touch, to join the Friends if we can. As our group disperses into the warm, summery evening of Mile End, we head for the station and the start of our journey home. 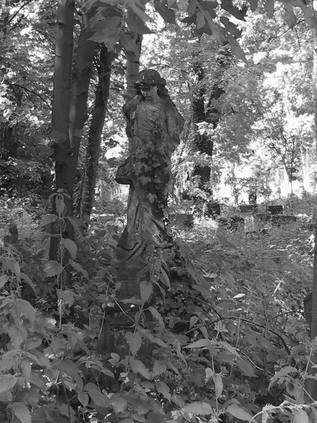 While a cemetery in Tower Hamlets might not feel like the most hidden or exciting spot, the tour has met the brief strangely well. I'm not sure how many times I've passed by here, hurrying to some other more exotic spot, scudding by on a train out of Fenchurch Street, or passing mere feet away on a bus. But right here, under our very noses is a place of deep-rooted history, local activism and dedicated conservation. Aware of the burden they carry for managing the past, the Friends of the Cemetery make careful judgements about balancing respect and recreation. They're definitely getting it right so far.